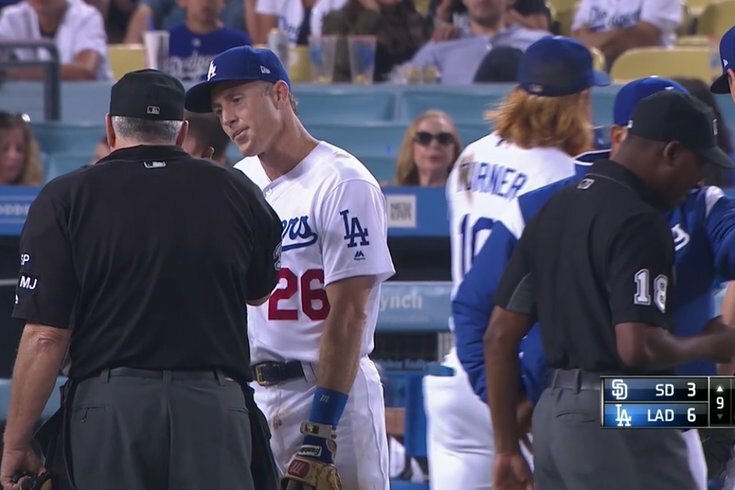 Chase Utley was thrown out of last night's game at Dodger Stadium for asking the second base umpire to move out of his line of sight. It was just the second ejection of Utley's career. Saturday night was a lively one across baseball. Aaron Nola had another masterful performance in South Philly (and he has numbers that, if they stay at this pace, will get him Cy Young Award votes in a few months). Bryce Harper suffered a gruesome injury on a rain-soaked field in Washington (but, thankfully for his sake, the Nationals sake, and baseball’s sake, Harper should be OK for the postseason). And Chase Utley got thrown out of a game in Los Angeles for asking a second base umpire to move out of his line of sight. Yes, while you were (probably) sleeping, Utley was thrown out of the Dodgers-Padres game with the game-tying run up to bat in the ninth inning when he apparently wasn’t happy with second-year umpire Ramon DeJesus’s answer after a brief discussion. Umpires moving out of the sight lines of infielders is commonplace, of course. Oftentimes an umpire will initiate the conversation, making sure he’s out of the way. Dodgers manager Dave Roberts was obviously not happy and went out to argue on Utley's behalf. "In my opinion, it was a big toss," Roberts told reporters, including MLB.com. "A guy like Chase, who is respected around the game, I was shocked." You should check out the entire postgame interview below. It’s classic Utley, right down to the Pat Burrell 'Thanks Guys’ turn to shut things down on his own terms. If you’re curious about such things – as I was – this was just the second ejection of Utley’s 15-year big league career. Utley’s only other ejection came way back on April 23, 2006 (a few months before his “You Are the Man” moment) in the first inning of an eventual 4-2 win over the Florida Marlins. Utley and manager Charlie Manuel were tossed after both believed that Utley beat out an infield single (which would have scored Jimmy Rollins). Here’s a recount of that one from my old pal Stephen Miller of the Allentown Morning Call. When [Dan] Iassogna called Utley out, Utley turned and slammed his helmet to the grass. Iassogna responded by tossing Utley from the game. "I didn't even see him throw me out," Utley said. "I definitely wasn't trying to get thrown out." Utley and first base coach Marc Bombard argued the call for several seconds before Utley was nudged to the dugout, where he learned of his ejection. Incensed, he raced onto the field and continued yelling at Iassogna while several coaches kept him from getting too close to the umpire. Manuel had also reached the field by that point, where he argued enough to earn his own ejection. And if you're dying for more #content of the guys from the Phillies glory years, here's a PhillyVoice Q&A with Utley from last summer and here's some news on Ryan Howard from just yesterday. Hey, it is Alumni Weekend here in South Philly.